One of the reasons we like QuickBooks is because it uses language and processes that are familiar to small businesspeople. Instead of using the term “accounts receivable,” it has a menu label that says Customers and menu items that use phrases like Create Invoices and Receive Payments. You would have to go into the Chart of Accounts to find standard accounting terminology – and we never recommend that you do that without consulting with us first. Before you record your first payment, you’ll need to make sure that QuickBooks is set up to accommodate its Payment Method. QuickBooks comes with some standard types, but you can add, edit, and delete your own options (though not those that are built into the software). 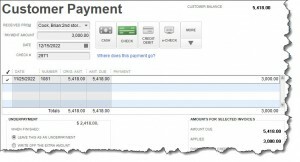 There’s more than one way to record a customer payment in QuickBooks. Do you know when to employ these methods? Let us help you. If a customer pays immediately for goods or services you’ve provided, you’ll need to fill out a Sales Receipt, not a Customer Payment in QuickBooks. Here is how. Do you sell goods or services away from the office? 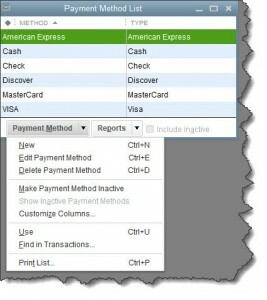 Did you know you can receive payment and issue receipts on your mobile device via QuickBooks? We can show you how.